From MTP Glass comes this collab with Danny Camp, the Mismatched Mallow Tube. MTP's signature mismatched linework, combined with Danny's realistic Marshmallow on a stick. This is one of many collabs but still one of a kind. Camp friendly and trippy all the same. 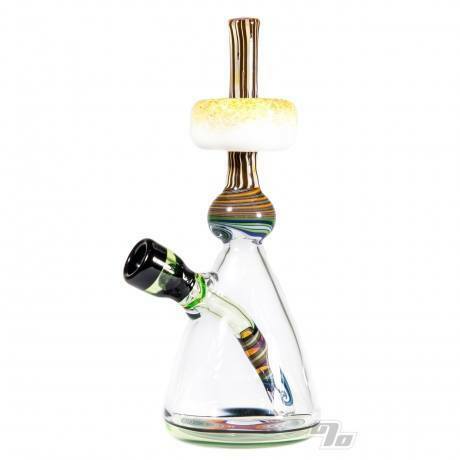 This MTP / Danny Camp rig is a one of a kind meaning what you see is what you get. Free Shipping in the US and No Sales Tax! Functional and measures up at approx 8 inches tall 3 inches wide at the base. 14mm female joint for your favorite quartz banger or e-nail. 2 hole diffy for plenty of bubbler action on the pull and just the right amount of resistance. More photos coming soon.